V.I.P.P! Very Important Page in progress….. CONSIDER EXODUS 20:1-7>-11 in context of ROMANS 6 and HEBREWS 6! We who are AVOWED unto the HOLY NAME for HIS GLORY are DUTIFULLY BOUND unto the FRUITION of ALL HIS WILL! Shall we continue in SIN, shall we be satisfied far from COMPLETE, and yet expect that GIFTS of KINDNESS, the GRACE of YAH from ABOVE to ABOUND? Shall we remain DOUBLE-MINDED not seeking ALL that is REQUIRED in YAH to make us LIKE-MINDEDLY WHOLE and expect to continually receive ANYTHING from YAH? YAH FORBID! The nature of a LIAR is that he will never tell you the WHOLE TRUTH. Rather he will lead you astray by giving you only enough to draw hastily immature conclusions. Then he will make fodder of you to satiate his greed and treachery by flattering you while leaving you in ignorance being predisposed to ignore what is wiser. In the gifts of the ONE MOST HIGH to HIS glory, by HIS Spirit offer you what is missing and little been considered that in preparing more wisely you may be made COMPLETE. SHALOM! VERY IMPORTANT MESSAGE! 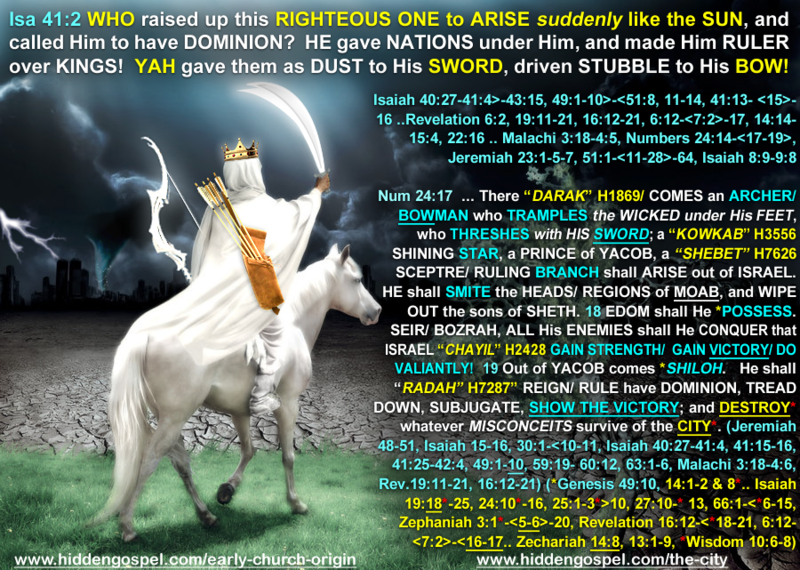 HEAR THIS VERY PRECIOUS CALL of YAH to HIS ELECT of ZION! THIS IS THE VOICE OF SALVATION! AGAIN! CONSIDER EXODUS 20:1-7>-11 in context of ROMANS 6 and HEBREWS 6! We who are AVOWED unto the HOLY NAME for HIS GLORY are DUTIFULLY BOUND unto the FRUITION of ALL HIS WILL! Shall we continue in SIN, shall we be satisfied far from COMPLETE, and yet expect that GIFTS of KINDNESS, the GRACE of YAH from ABOVE to ABOUND? Shall we remain DOUBLE-MINDED not seeking ALL that is REQUIRED in YAH to make us LIKE-MINDEDLY WHOLE and expect to continually receive ANYTHING from YAH? YAH FORBID! The day is upon us when ALL must know that YAH will give and will receive from this EARTH ALL that HE from the BEGINNING has required of it. A coming GLOBAL BLIGHT shall compell a WORLD to seek fully ALL that has been for AGES MISSING from the CONSCIENCE of MAN that in the PRAISE of the ONE MOST HIGH, those which remain shall STRIVE to be made in ALL THINGS COMPLETE! (Zechariah 13) The RIGHTEOUS SOUL shall SEEKS YAH by FAITH knowing HIS PURPOSE for US as a PEOPLE formed unto HIS GLORY, FAR exceeds what SELFISH ROBBERS in their BLINDED VANITY say is sufficient, always unto the DENIAL of PEACE! They who understand we are a PEOPLE devoted to mutually give of ourselves as ONE unto this MUTUAL COVENANT unto LIFE and PEACE shall be made to know at last in the days to come. We shall discern to be REVERENTLY THANKFUL for the BLESSINGS of WISDOM to know HIS WILL granted of the MOST HIGH YAH! For many generations have men HID from men what is necessary to be made WHOLE! Who now being called to REMEMBRANCE will have FAITH COMPLETE? STAY TUNED! THIS VERY VERY PRECIOUS TOPIC OF UTMOST IMPORTANCE IS INDEED SO VERY PRECIOUS THAT NONE , I REPEAT NONE HAS POWER TO EVEN BEGIN TO LEGITIMATELY CLAIM EVEN OPPORTUNITY UNTO ETERNAL LIFE WITHOUT IT IN THE MAGNITUDE OF ITS IMMENSE IMPLICATIONS! OF THIS TRUTH YAH BEARS ME WITNESS! FOR THIS IS THE WISDOM OF YAH, EVEN THE WISDOM THAT WAS FOUNDATION TO ALL THE ANCIENT SAINTS! THERE ARE PRECIOUS TRUTHS FOUND HERE ON THIS WEBSITE RARE TO BE FOUND ANYWHERE ELSE IN ALL THE WORLD! THEREFORE IT IS VERY WISE TO SUPPORT THIS MINISTRY WHILE YET IT CAN BE SAID THAT WHEN YOU DID SEE IT, COUNTING IT WORTHY, YOU DID! The HIDDEN LIGHT of the GOSPEL TRUTH must be DENIED NO LONGER! GREAT is the MESSAGE and the LABOR! But FAR MORE BLESSED than MIND can IMAGINE is the REWARD to them who will RECEIVE IT! WHERE are the FRIENDS, the CALLED and CHOSEN ALLIES of the MOST HIGH YAH for the HOPE of HIS PEOPLE ISRAEL who DISCERN to KNOW that THIS FERVENT MESSAGE DESERVES of US ALL OUR MUTUAL LOVE and DILIGENT SUPPORT? YOUR HELP is NEEDED and is SURELY APPRECIATED! OUR PEOPLE must KNOW THESE THINGS! WHAT MANY SEEKER would PURSUE is HERE to FIND! NEW REVELATIONS each day! Give as your HEART is able! My PRAYERS and BLESSING, even the DILIGENTS of my soul is for the SURE MERCIES of DAVID to be WITH YOU ALL who LOVE the MOST HIGH! The TAB BELOW will take you a special page where you may submit your most appreciated DONATION of LOVE and SUPPORT of this MINISTRY where it shall NOT be FORGOTTEN! In ALL THINGS unto HIS PURPOSE and PROMISE, WE BELIEVE YAH will SURELY according to HIS PURPOSE, PROVIDE! The MOST HIGH YAH SURELY BLESS and KEEP YOU in HIS KEEPING, FOREVER!